Whether you’re gathering for a family reunion, the big game, business meeting or a fun Friday night, delicious, authentic Valentino’s Italian food is the way to get the party started. 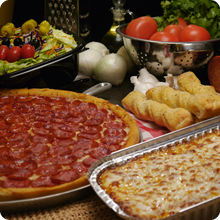 Our catering group offers a wide variety of choices, including our award-winning pizza, pastas and salads. For the finest in catering, call (402) 467-1943 in Lincoln, or (402) 571-3001 in Omaha. For catering from any other location, please call them direct for their selection and prices.